It felt really strange to go back to the real world, like I have somehow returned to my life from a brief sojourn in another world. In some ways I have; my life whilst I was at LARA was strange and intense. A constant movement in travel from a 6 hour commute and drawing; working to the strange irregular rhythm of sight-size. I would wake up at night sometimes, as if from a nightmare, desperate to know why I wasn’t moving, the stillness in my body suffocating. I miss the life drawing the most, the fabulous models, the gestures of the light, space and taking the rhythm of the day in 20 minute increments. I even, and I surprise myself by saying this, miss cast drawing, and painting. Casts are such timeless objects, and time is such a luxury in which to draw them, to learn, draw and redraw. 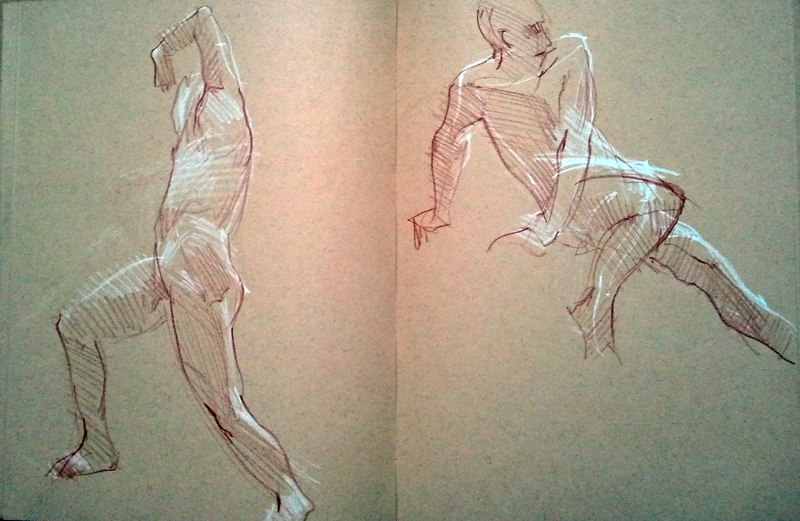 I miss fast high energy drawing too, the way it balanced out the longer hours of sight-size study and helped to remind me that I can draw something worthwhile in less than a month; less than a minute even. I always found it hard to reconcile at the end of each term just how little work there was. I produced more than many, yet still so little. Quality over quantity, I know but productivity is as good a lesson to learn. I still like to see the drawings and paintings that my cohort, still studying, are producing and I pour over them with a kind of hunger and occasional envy. I keep checking back, but they don’t hold the appeal for me that they once did. I knew when I first went that my time was limited, that it was a luxury, albeit an essential one. I didn’t know how it would change me and my work. I learned a great deal but I also lost something, in all the discipline and over-riding process. My sense of feeling got flattened. Both emotional connection and the sense of proprioceptive relationship/proximity. There seemed to be no place there for those levels of connection, no pedagogy to deal with the elephant in the room. Yet I think it had to be that way. I had to see what was missing, to see what might be in the space made by the gaps. With the benefit of hindsight, perhaps that was the point, because it was through seeing that space that I began to deepen my own search for the missing pieces of the puzzle. I also lost confidence in my work – oddly perhaps given the improvement in my drawing skills but then the comparison became so much sharper, the bar for potential achievement set that much higher. I’ve seen that the traditions in which I’ve studied connect me with the works of great masters in museums. What might lie between me and that level of accomplishment? I’m almost ashamed to ask but now the underlying assumption is of possibility, what might…? rather than, why can’t…? I’ve talked about integrating what I’ve learned before but I now think it runs deeper. My artistic world has irrevocably expanded, not just a little but exponentially. Whole new vistas have opened up. I need a map. How do I develop my work? How do I find it (and me) a place in the world? How do I relate it to contemporary culture when it seems to belong in and come from another? And the other questions. Does it mean I failed? because I did not complete? Can I just take the things I did learn, as well as all the snippets I’ve noted and will later come to understand and be content? If I place such emphasis on completion and the structure of the programme is it better that I find my own way? To seek solutions there or elsewhere but to questions of my own devising, to use my own momentum and meet the forces that drive me. Maybe I have failed here, in this. Maybe I needed to, and to understand my failure to turn it into a bigger success. I need to be braver, I must fail, I must trust myself and follow my instincts, stand or fall. Can I be comforted, knowing that the knowledge is all there waiting for me to discover from many other teachers and from the masters; understanding that the most direct route is neither what it appears, nor the best?